Connecticut law also prohibits discrimination in all of the above categories plus these additional categories: lawful source of income, marital status, sexual orientation, gender identity or expression, use of a guide dog, and age (except when program regulations restrict the housing to an age-specific category). Complaints of discrimination may be forwarded to the Commission on Human Rights & Opportunities at (860) 541-3400. 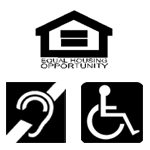 Elderly Housing Management, Community Housing Management, and their managed facilities do not discriminate on the basis of disability status in the admission or access to, or treatment or employment in, their federally assisted programs and activities. The community is funded through the U.S. Department of HUD 202 PRAC program and, as such, the head or co-head of each household must be 62 years of age or older. The complex includes one, fully-accessible apartment for persons with disabilities. The complex also features a community room and common spaces for resident enjoyment, interior laundry and postal facilities. On-site Administration is available. All apartments are eligible for Project Rental Assistance; in general, rent is set at 30% of adjusted household income.